The drive out to Pasadena didn’t take long. The parking, however, was a different story. After dropping Shelby off to let the bistro know that yes we were actually here on time but we can’t find parking, Jen drove around for a good five to ten minutes before we found something. 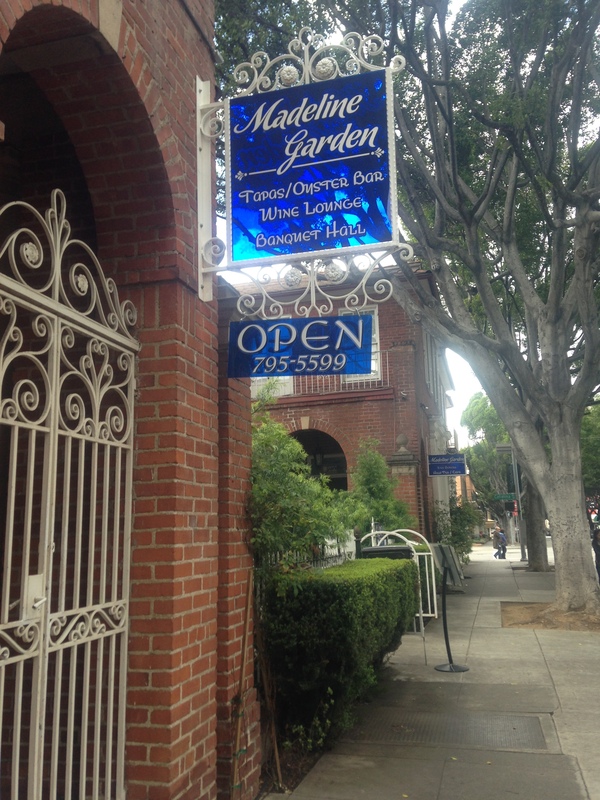 Madeline Garden Bistro and Venue is located off of E. Green St. in Pasadena, a few blocks away from Old Pasadena. Make sure you have the address plugged into your smart phone or GPS or you will drive right past it. There’s a little blue sign that lets you know you found the right place. 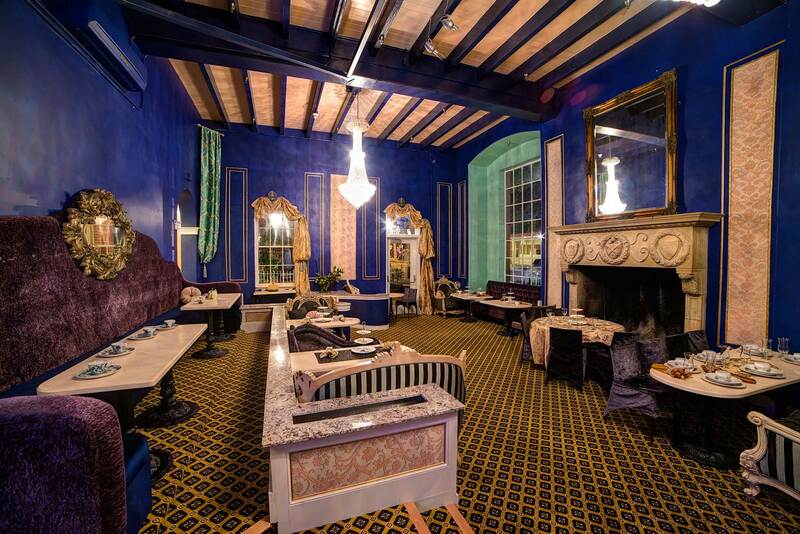 Otherwise, the bistro blends in with the rest of brick buildings. This last photo was essentially our view. 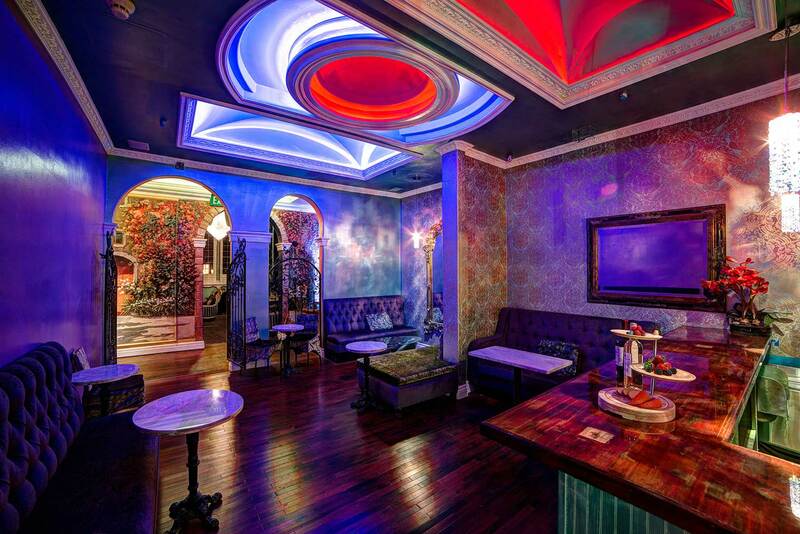 We were seated at a cute little table in the corner, complete with comfy couches and several pillows. There were two lovely chandeliers, however since it was overcast outside on the day that we went, the sun barely shined through the windows so the overall lighting in the room was a bit dim. 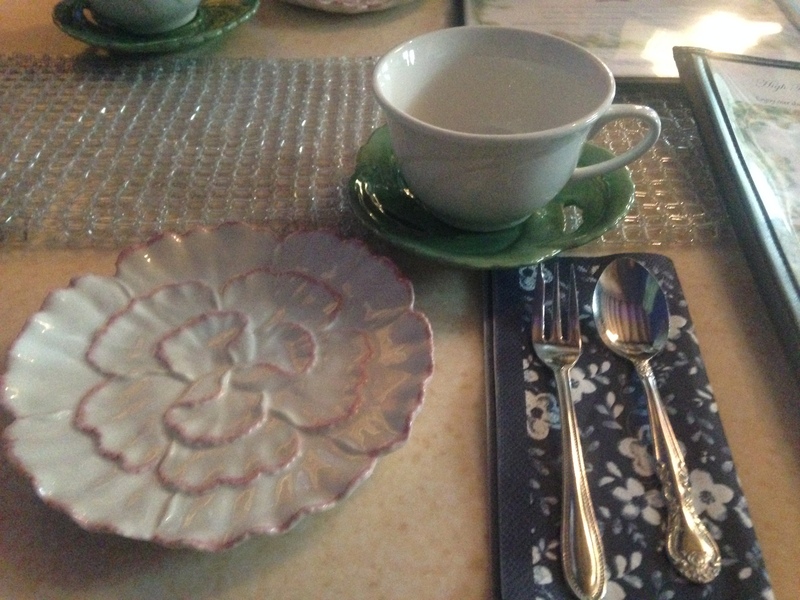 Each table setting had a tea-cup and saucer, a small plate and the essential silverware. The garden theme was apparent but still subtle. 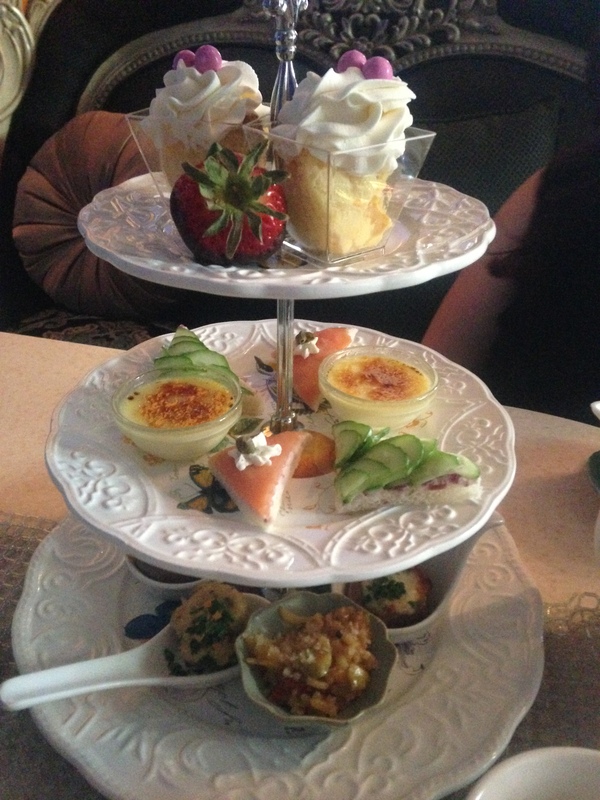 Our waiter was very informative and explained how High Tea worked. There were several different options on the menu and we ended up choosing the Princess Madeline, which included your choice of tea, scones, soup or salad, 5 options from the ‘savory’ course and 3 options from the ‘sweets’ course. 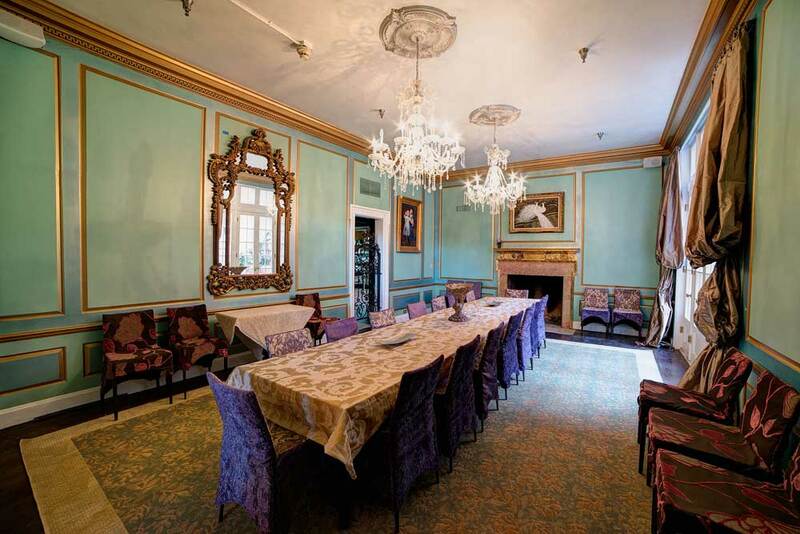 At first, I was a little disappointed that we didn’t get to choose our options, but having a ‘chef’s choice’ Royal High Tea at our Adult Tea Party also made it a more exciting. Shelby is allergic to shiitake mushrooms and scallops, which was taken into account so she was given a few different choices for her meal. 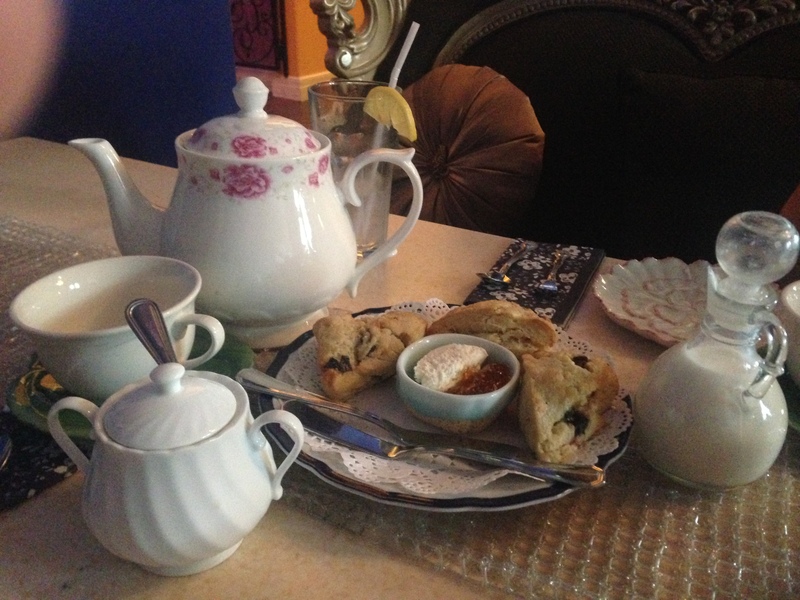 The tea came out first, followed closely by the scones. We chose Passion Fruit tea and English Breakfast. There were sugar cubes and cream so we could make our tea exactly how we liked it. The scones were light and fluffy and came with cream cheese and apricot jam to spread. Such a cute little teapot! We all picked soup over salad since it was a bit chilly that day. They had Rosemary Tomato and Ginger Yam on the menu. The Rosemary Tomato had little chucks of tomato in it and just a hint of rosemary. It was warm and soothing and left me wanting more. Soon after, the soup bowls and scone plates were whisked away and we were presented with our lunches. The ‘courses’ were separated evenly between three plates. Naturally, we started from the bottom and worked our way up. 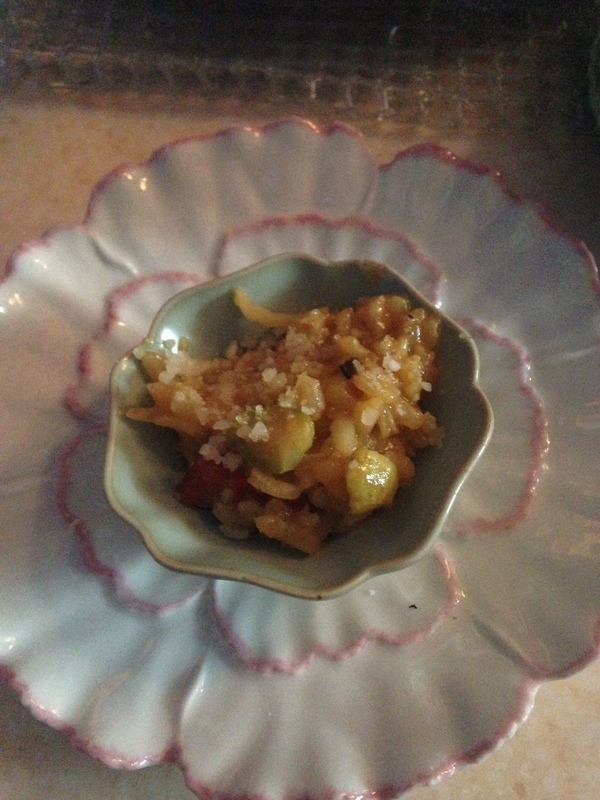 First up: the vegetable risotto. It was creamy and bursting with the flavors of sun-dried tomatoes, fresh cucumbers and corn. 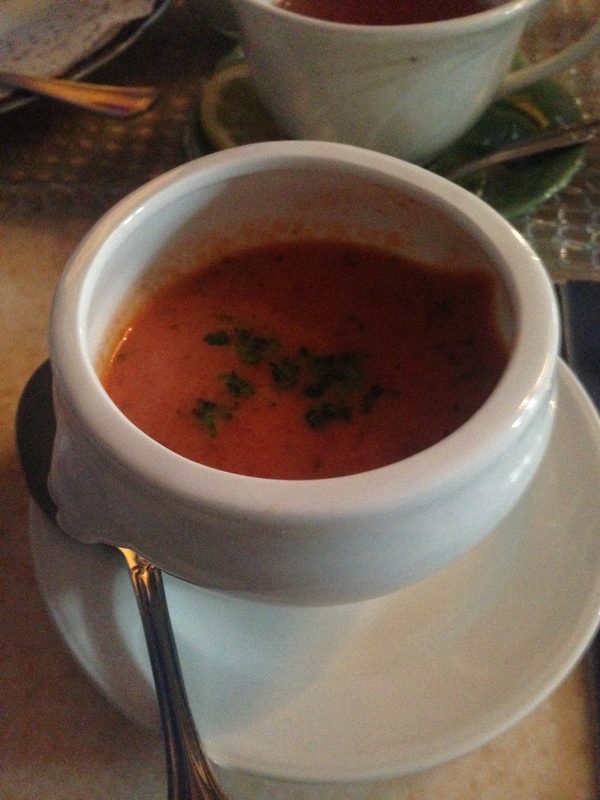 Served in a cute little bowl! 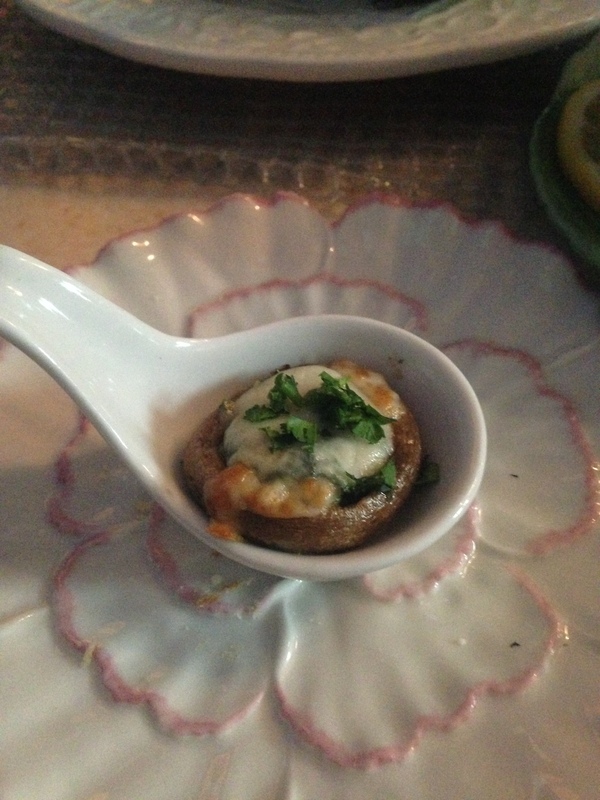 Second: portobello mushrooms stuffed to the brim with spinach and cheese. The spinach was cooked thoroughly and the taste of it definitely hits your taste buds first, followed closely by the mushroom and a hint of cheese. It was a little overpowering but still good. 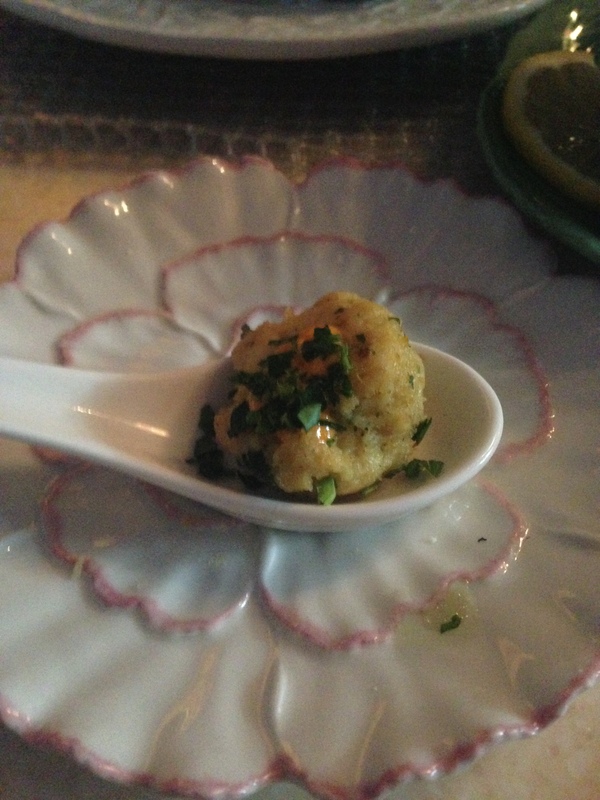 Third: a cute little crab cake. Although I’m not used to seeing round crab cakes, this little one was bursting with fresh crab and a hint of spices. Next up–open-faced finger sandwiches! 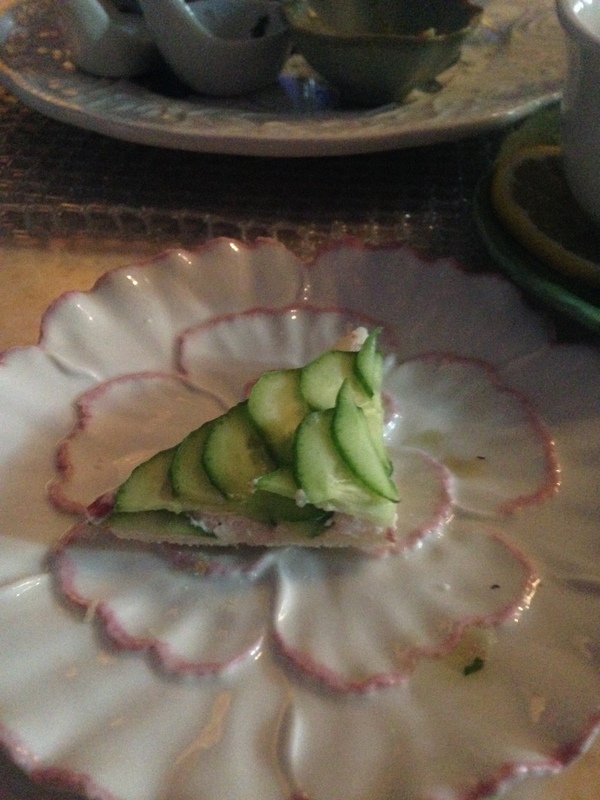 The first was a salmon and cream cheese combination and the next was your classic cucumber and cream cheese. 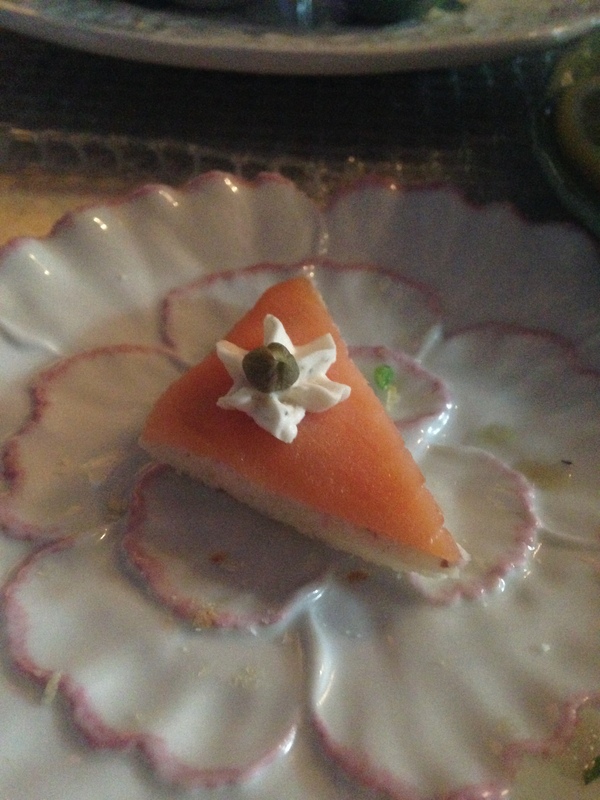 The salmon was lightly smoked and the cream cheese was raspberry-flavored. The cucumbers were thinly sliced and neatly arranged. There was also raspberry cream cheese underneath, which surprised me a bit as I usually take my cucumber/cream cheese sandwiches with regular old boring cream cheese. (Time for me to branch out a bit, I think). 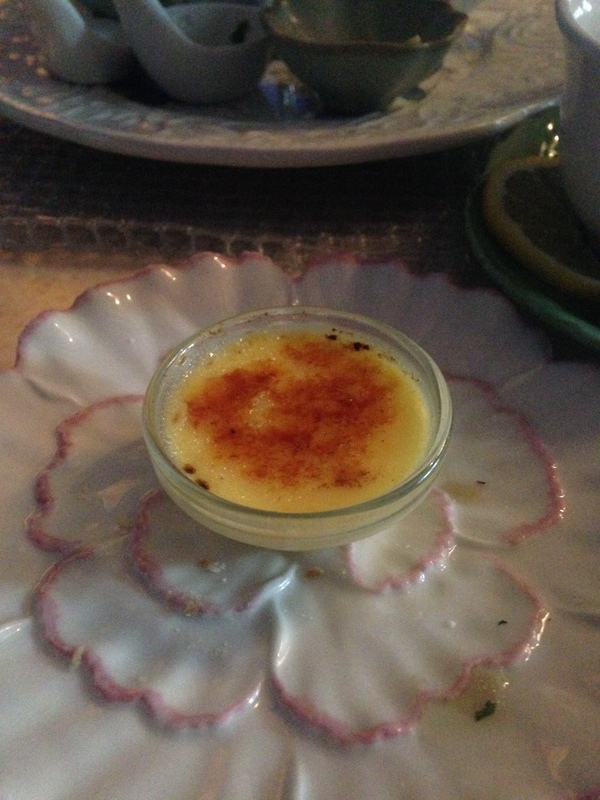 Moving onto dessert, we all got a cute little crème brûlée cup that was perfectly toasted on top. The vanilla flavored cream was almost like a pudding. Next, a combination of two of my favorite things: chocolate and strawberries. 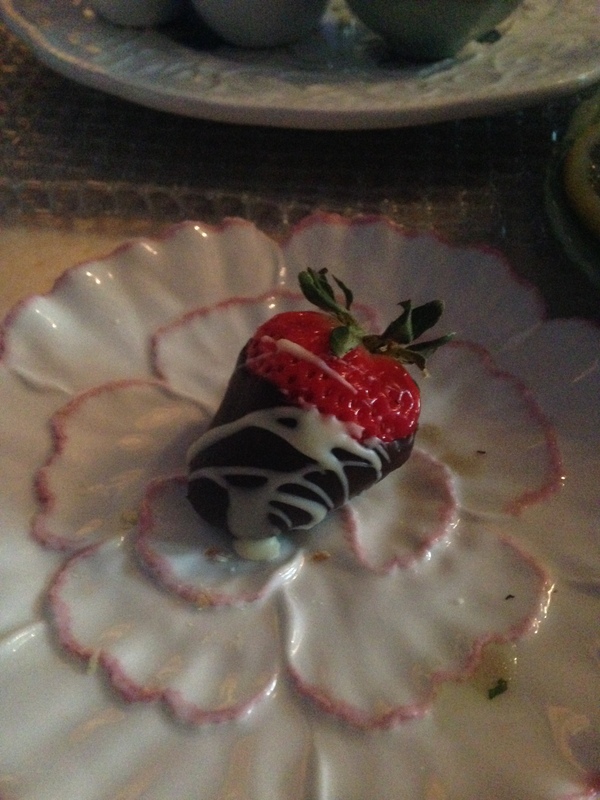 The chocolate was soft and stayed on the strawberry when I bit into it, which saved me from trying to catch any falling pieces of chocolate. 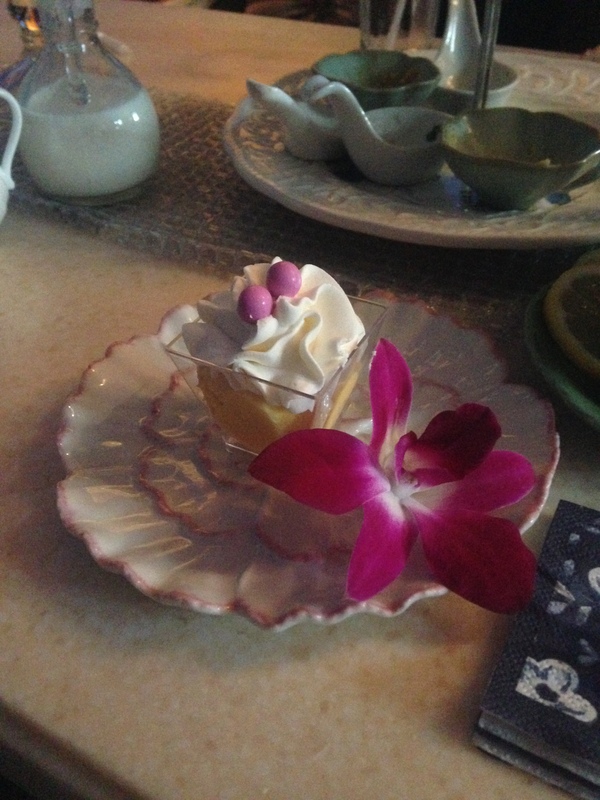 Lastly was a mini vanilla cupcake. Inside was a lovely surprise of a blackberry and guava-fused custard, which was one of the most delicious things ever. Seriously, I probably could have eaten five. Or more. To be honest, when we were presented with our lunches, I was afraid that I would still be hungry afterwards. (Hey, I really like to eat, okay?) But everything was paced nicely, the courses weren’t rushed and I think I was mostly full from the three cups of tea that I drank. I know that we all had a very good time and we want to try out another tea place soon. Fingers crossed for a reservation at Two a Tea. I am so thrilled to know that Adult Tea Parties exist. They are so much fun and I highly recommend trying it for yourself. Megan, Throughly enjoy your articles. I feel like I am there along side you!!! Also, for your site, I Love the definition of ‘Advenuring’ you chose.